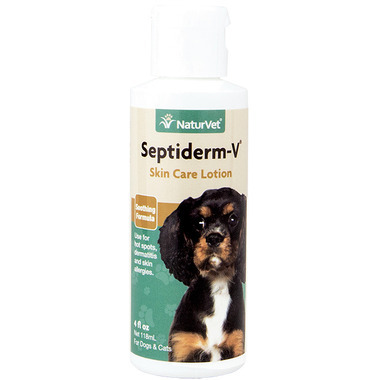 Naturvet Septiderm-V Skin Care Lotion is a soothing, non-greasy lotion for use on dogs and cats over the age of six weeks. It may be applied as often as necessary and is recommended to be used in conjunction with regular bathing with Septiderm-V Skin Care Bath. Contains: Deionized Water, Alkyldimethylbenzyl Ammonium Chloride C14 50%, C12 40%, C16 10%, Tetradecyl Trimethyl Ammonium Bromide; Ethanol 0.36% in an emollient lotion base containing emulsifiers and essential oils. Always follow the instructions attached to the label on this product!